The availability of Center V2 servers may be threatened by network overload. Thru Dispatch Server, arranging and distributing subscribers requests to the least busy Center V2 servers can settle the concern. With Dispatch Server, a central monitor station can run several Center V2 servers and serve a large number of subscribers with the fastest responding time. 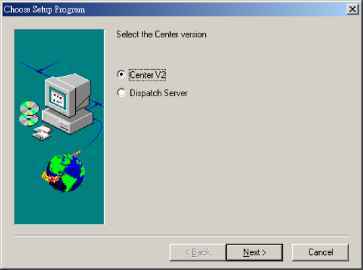 If any of the servers needs maintenance, Dispatch Server can automatically redistribute subscribers requests to other Center V2 within a server farm or to servers in another location. �������� CD-���� � ���������� CD-ROM ����������., ��������� ��������� setup.exe. �������� Center, ����������� ������ � ���������� ����������. ���������, ��� USB keypro ������������ ������� ������ ��������� � ����� USB � ��. �������� � ����, ����� ������ Center V2 ��� �������� ���������� � ������������ �������. ���� ���, �� ���������� ���������.